Happy Monday! It’s another week for our Virtual Book Club for Kids and this week’s theme is rainbows! We’re reading A Rainbow of my Own by Don Freeman. This week the Virtual book club co-hosts sharing fun rainbow themed activities to go along with the story. Be sure to scroll down after reading this post for more activities based on this week’s theme! 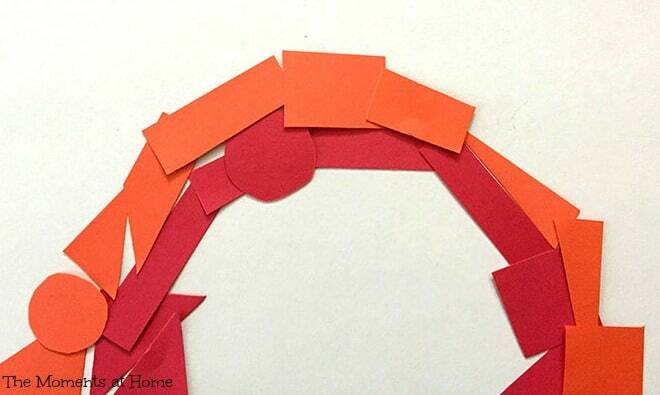 This week I’m sharing a paper shapes rainbow activity for kids. If you haven’t joined our weekly virtual bookclub for kids you can join here. You’ll gain access to future book club books, themes, and craft supply lists. Plus you can share your own book themed activities in the group! A Rainbow of my Own by Don Freeman is a cute story about a little boy who wants to catch a rainbow of his very own. He puts on his rain boots and jacket to head outside to catch the rainbow. The illustrations in this sweet story are full of colorful rainbows contrasting with the dark rainy weather. Everyone wants a rainbow of their own don’t they? This is a simple rainbow craft that can be fun for kids ages toddler through Kindergarten. 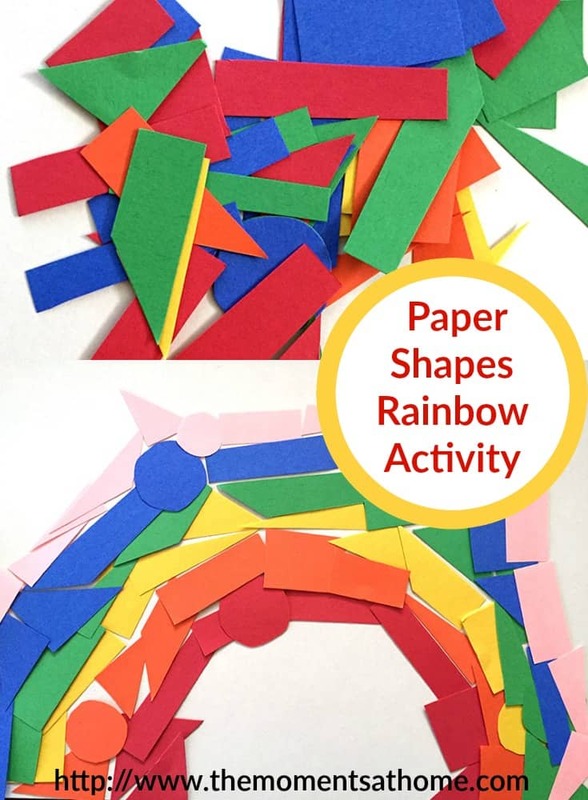 The rainbow is made of different shapes kids cut themselves (or you can do the cutting to save time) which help develop those fine motor muscles and scissor skills. Start by cutting several shapes such as squares, triangles, rectangles and circles from red, orange, yellow, green, blue and purple construction paper. The larger the shapes the less the kids will need for their rainbow. Don’t make the shapes too small because kids might get frustrated with trying to fit together tiny shapes to create their rainbow. Starting with red shapes, fit the pieces of paper together in the shape of a rainbow on paper or a tabletop. Continue thorugh all the colors of the rainbow until your rainbow is complete! If you’re doing this activity on paper you can glue the pieces with a glue stick as you go for a pretty spring art project. If you’re doing this activity on a table top put your rainbow pieces in storage container to use again and again!